Oil fell for a third day, the longest losing streak in almost a month, as U.S. crude stockpiles resumed their expansion. Futures in New York dropped 1.3 percent after the Energy Information Administration reported U.S. crude inventories increased by 1.64 million barrels last week. That was almost double the median estimate in a Bloomberg survey. 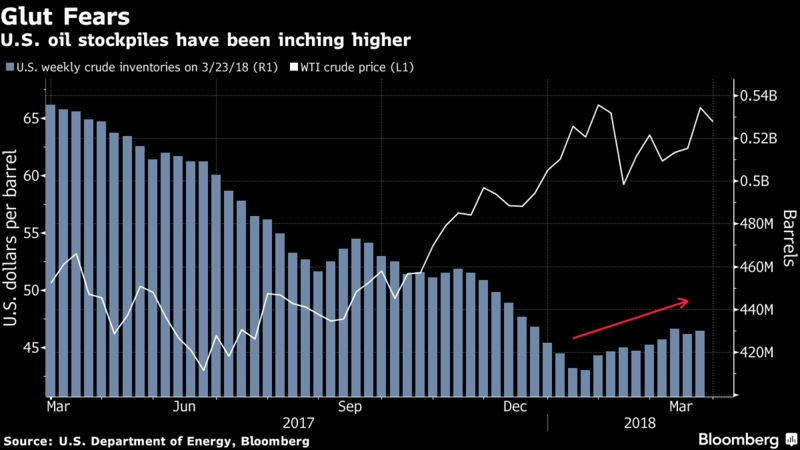 Before this week, oil had recovered from February’s losses after U.S. President Donald Trump named hawkish officials to his government, signaling the nation may pursue a more hard-line approach toward OPEC member Iran. Still, fears remain that surging American shale production could thwart efforts by the Organization of the Petroleum Exporting Countries to reduce a global oversupply. West Texas Intermediate crude for May delivery lost 87 cents to settle at $64.38 a barrel on the New York Mercantile Exchange. Brent for May settlement dropped 58 cents to close at $69.53 on the London-based ICE Futures Europe exchange. The stockpile increase was the fourth in five weeks. Inventories at the Cushing, Oklahoma, storage hub jumped 1.8 million barrels, the most since a year ago. Meanwhile gasoline supplies fell 3.47 million barrels, according to the EIA. "Mostly we were looking for decline in inventories, for starters, so that’s surprised a lot of people in the market," John Kilduff, founding partner at Again Capital, said in a phone interview.